Symbol LS4208 - Nordstrom Scanner Kit, Multi-Interface, 1-D. Durable construction for all day, everyday usage. 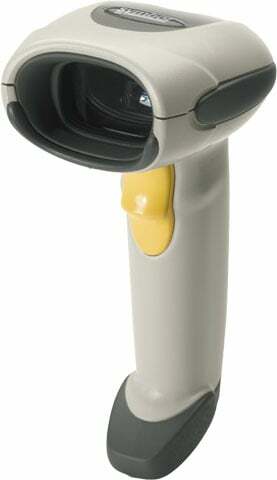 The LS4208 is the next generation of Symbol's best selling LS4000 laser scanner series. Designed to increase efficiencies in scan-intensive operations, the LS4208 laser handheld scanner accelerates throughput with productivity-enhancing features never before delivered by a single scanner. It offers continuous, one-pass scanning, allowing novice and advanced users alike to process more items more rapidly and spend less time keying in data. With its innovative multi-line rastering scan pattern, the Symbol LS4208 enables the quick and accurate scanning of all types of one-dimensional (1D) symbologies, including damaged symbols and stacked reduced space symbology (RSS) barcodes. It also provides a wide working range and superior motion tolerance to increase scanning flexibility and performance. Choose from a variety of interfaces, including USB, RS-232 and Keyboard wedge. USB, Power Plus connector, 7 ft, Straight. The Symbol LS4208-SR20141ZZR is also known as Symbol Technologies	SYM-LS4208SR20141ZZR	or LS4208SR20141ZZR	.